Stu: This week we welcome JJ Virgin to the show. JJ is a prominent TV and media personality, whose previous features include co-host of TLC’s Freaky Eaters, 2 years as the on-camera nutritionist for weight loss challenges on Dr. Phil, and appearances on PBS, Dr. Oz, Rachael Ray, Access Hollywood, and the TODAY Show. She also speaks regularly and has shared the stage with notables including TD Jakes, Tony Robbins, and Brendon Burchard. 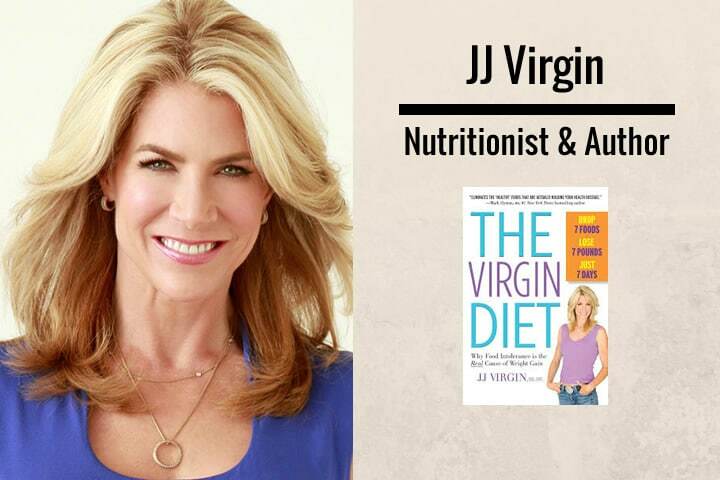 JJ is the author of four NY Times bestsellers, The Virgin Diet, The Virgin Diet Cookbook, JJ Virgin’s Sugar Impact Diet, and JJ Virgin’s Sugar Impact Diet Cookbook. Her most recent title is Warrior Mom: 7 Secrets to Bold, Brave Resilience. In this interview we discuss the link between food intolerances and weight loss, enjoy. It seems every 2nd person has a food intolerance these days, why do you think that is? Is there a gold standard for testing? How long does it typically take to overcome food intolerances. 00:03 Hey, this is Stu from 180 Nutrition and welcome to another episode of the health sessions. It’s here that we connect with the world’s best experts in healthy, wellness, and human performance in an attempt to cut through the confusion around what it actually takes to achieve a long lasting health. 00:18 Now, I’m sure that’s something that we all strive to have. I certainly do. Before we get into the show today, you might not know that we make products, too. That’s right. We’re into whole food nutrition and have a range [00:00:30] of super foods and natural supplements to help support your day. If you are curious, want to find out more, just jump over to our website. That is 180nutrition.com/au, and take a look. Okay, back to the show. 00:44 This week, I’m excited to welcome JJ Virgin. 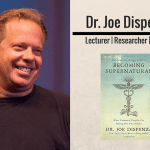 JJ is a celebrity nutrition and fitness expert, four-times New York Times best-selling author who has helped hundreds of thousands of people transform their lives. 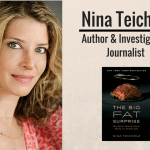 In this interview, we discuss the link from food [00:01:00] intolerances to weight gain and how we can start to reverse the issues that surround this. JJ is an absolute pioneer in her field and the tips, tricks, and strategies that she shares are applicable to everyone. Over to JJ. Hey, guys, this is Stu from 180 Nutrition and I am delighted to welcome JJ Virgin to the podcast today. JJ, how are you? 01:24 I am good. I always feel like I just got smarter when there’s a British accent involved. Stu: 01:30 [00:01:30] I don’t know what to say about that. I wish I was as smart as I sounded, but we’ll see how we go. First up, for all of those who may not be familiar with you or your work, I’d love it if you could just tell us a little bit about who you are and perhaps what you do and why you do it. 01:48 I am a nutrition and fitness expert, and I’m obsessed with weight loss, and I feel vindicated, actually, these last couple weeks because I have been literally [00:02:00] into health since the age of 12, and in my 20s, when I started out as a personal trainer, I was one of the first three in the country in the United States: me, and Body by Jake, and Mark Sisson. It was so obvious so quickly that what we were being taught in graduate school, which is calories in, calories out, was a complete ruse. I was like, “All right, I’m gonna figure this out,” and I went in and I did 40 graduate and doctoral courses. 02:25 I started going through everything I could find, and what I came to the conclusion [00:02:30] of is that all calories weren’t created equal, that our body’s not a bank account, it’s a chemistry lab, and you have to think of the hormonal effects of food. It was like I said, “Santa Claus, the tooth fairy, and the Easter bunny are all frauds,” so it was like I was attacking peoples religions. I was like, “Oh, my gosh,” and what I’m super excited about now is I’ve been, for the last couple decades, looking at everything that could get in the way of you using weight or cause you to gain weight which is how food intolerance and all that came [00:03:00] to be. Just a couple weeks ago, Dr. David Ludwig posted his research findings that, lo and behold, all calories are not created equal. 03:35 Well, it didn’t take long, did it? I’m particularly interested in the food intolerance aspect today and how that relates to weight gain, as well, because it seems that every second person has a food intolerance or a sensitivity to something these days, and more alarmingly, the kids, the children going to school, they’re allergic to everything under the sun and they’re gaining weight. [00:04:00] Now, that didn’t happen when I was in school. There was like a token kid who was overweight. 04:05 Remember? Remember the token kid. By the way, the token kid wasn’t obese. They were just overweight. 04:11 They’d be normal now. That’s what all the kids look like. To have one in five kids as obese is insane. It’s insane. I don’t know what the stats are in the UK, but I bet they’re pretty similar. 04:25 Yeah, they’re very similar. They’re very similar, and I’ve had lots of conversations with some [00:04:30] very smart people, as well, who have theorized exactly why that is, but I’m super keen to get your take on that because it doesn’t seem to be going away. It seems to be getting worse. 04:40 It is getting worse and there’s a variety of reasons why, and it can be turned around, but it’s literally like turning around a freight train, so I think if we’re gonna look at what’s going on with our kids, because it’s a fact that kids should be very metabolically healthy, very metabolically flexible, so if they’re messed up, we’re all really messed [00:05:00] up. Now, you look at in the US, there’s more obese people than overweight people for the first time ever. We’ve got, what, 35% to 40% obesity and 30% overweight. That’s ridiculous. 05:15 There’s a variety of different reasons. One of them, obviously, you look at our diet and what do we have going on? Because you said, “Gosh, it seems like everybody has a food insensitivity or a food intolerance or an allergy,” and at first, people might think, “Well, that’s just because of the hype,” [00:05:30] and it’s like, “Actually, no it’s not.” What’s interesting is I didn’t go looking at food intolerance thinking, “Is this causing weight gain?” I actually was teaching doctors how to use different types of functional labs in their practice, and I loved doing food sensitivity testing because I could get people to stick with their diets. 05:53 One of the things I’ve seen with testing is that when you do testing and people get a result, they go, “Oh, I have to follow this,” rather than you saying, “Hey, you shouldn’t eat [00:06:00] that gluten.” People were coming into the office and I was teaching doctors how to run this through their office, so I saw so many patients, and I saw so many lab results. 06:11 This is very different than an allergy, although we’re seeing a rise in allergies, as well. An allergy is someone opens the bag of peanuts on the plane. Someone gets anaphylactic shock and could die. That’s different than an intolerance where all of a sudden you get tired, a couple hours later maybe cramping. It’s a delayed symptom in response to a [00:06:30] food that you’ve developed over time versus an allergic response is generally something quite often it’s genetic, but it’s an immediate response and often life-threatening. It’s extreme. You know you had it. They do allergy testing. I’m like, “I’m pretty sure I knew,” you know? 06:47 If something gave me hives, I know. An intolerance is the same as a sensitivity. In fact, when I wrote The Virgin Diet, we all sat around and went, “What should we call it?” because I kept having to defend the fact it wasn’t an allergy because that’s what everybody wanted to call it. I go, “You [00:07:00] cannot call it that,” and I think intolerance, people get that. It just makes sense. 07:07 Why does it seem like everybody has these? Because everybody has them. Why is that? Well, here’s the reasons. Number one, your gut. It’s all because of something called leaky gut. Your small intestine’s semi-permeable. It shouldn’t be really permeable. It shouldn’t be wholly or leaky. It should let little things pass through, but not big things. What’s happened [00:07:30] is a variety of different factors make your gut more permeable. 08:00 Also, kids now are on their phones and why does a 10 year old need a phone? Why do they need a phone? Anyway, they’re on their phones, but they’re also on their phones late at night, so where the would’ve been sleeping before, now they’re using technology, and that’s another form of stress. It’s making their gut leakier. The number one thing that makes your gut leaky is stress. It is by far the worst, and then you’ve got the stress of social media which is just ridiculous. Of everyone posting how [00:08:30] beautiful their life is so that you feel like comparison fills joy, right? 08:34 You got those things. Then, let’s look at diet. You’ve got a low fiber diet. Well, fiber feeds the gut microbiome that keeps your guy healthy, so we’ve got that going down. We’ve got all the GMOs that are damaging the gut microbiome, and then we’ve got fructose where 100 years ago, you got fructose because you ate a piece of fruit. You didn’t drink some special drink [00:09:00] that had a bunch of fruit juice in it. You didn’t have apple juice concentrated added to the health foods. You didn’t have agave as a health food. You didn’t eat these things that are bombarding you with fructose which makes your gut more permeable. 09:12 Also, gluten, which they add to everything, so you might go, “Well, I’m not eating bread,” but they add gluten into all sorts of things because it stabilizes and makes things taste better, so gluten makes your gut more permeable, and then a lot of the different medications, especially pain medications, make [00:09:30] your gut more permeable, so you have all these different things that together can make your gut more permeable and these are things that our kids are getting at an early age. 09:38 Then, you couple that with bad digestive habits like not really chewing, drinking a ton of fluid, super gulp, big gulps, all that kind of, with your mills, and lowered stomach acid due to stress or aging, and now you’ve got poorly digested food particles hitting a small intestine that’s more permeable letting go out into the circulation [00:10:00] where your body goes, “What the hell is that?” and launches an immune attack. If it was just every once in a while, those little food particles, those antigens, would be glommed on by these antibodies and taken care of like little Pac-Men and eaten up and spit out, but the problem is we eat the same stuff every single day. 10:17 Every day, we’re getting gluten, dairy, eggs, soy, corn, peanuts, and the ones I identified the most, gluten, dairy, and eggs by far were the ones people were most commonly responding to. You’re getting [00:10:30] those every day because they put them in the silliest places you would never expect that they have no business being. You order a grass-fed steak at a restaurant and they put gluten on it to make it taste better, wheat flour, and it’s just dumb. You buy the French fries. Shouldn’t be eating at a fast food restaurant, but let’s say you did. They put gluten on the French fries to make them taste better, so they sneak these things in to places you wouldn’t really expect. 11:34 That’s just insane, and I guess due to the constant bombardment of these crazy foods that you’re eating and your lowered immunity, we get sick more and when we get sick, we take antibiotics, and then that further compounds the issue, as well. Boy, oh boy. 11:51 Yeah. Scorched earth on the microbiome, and then, yeah. That’s forever to rebuild, but you’re not rebuilding because then you don’t know that you need to. 11:59 Frightening. [00:12:00] I tell my kids continuously, “Boy, you should’ve seen when I was a boy.” No mobile phones, none of this craziness, no 24/7 TV. We went out and we played on our bikes. We came back when it was dark. We ate our dinner and we went to bed. I’m a kid of the ages. 12:18 Yeah, exactly. “Yeah, you’re boring. You’re boring.” If we wanted to start to overcome this issue, and let’s just say that we’re familiar, then, with [00:12:30] the issues, the triggers, and we’re gonna be quite proactive in order to try and reduce those from our diet, where would I start in terms of testing? Because it’s always good, I would imagine, to get a benchmark. Would it be food intolerance? Would it be gut permeability? What would you suggest? 12:47 It’s very interesting. I was running a couple different test. As I was telling you, I was teaching doctors this testing, so we were doing stool tests. We were doing organic acid tests and we were doing food sensitivity tests, [00:13:00] and then we wait for the test results to come back. Well, I kind of went, “Well, this is silly. I gotta do something while they’re waiting,” so what I started to do while they were waiting was I pulled out the foods that were most common, and the foods that were most common was gluten was a different way to test, but it was dairy and eggs, and then corn and soy and peanuts, and then of course, I had to deal with sugar because sugar was creating a lot of the problems. 14:00 I said, “Alright. Let’s just test these foods back now and see how you do with them.” It was rare that I ever saw a food beyond those foods I just told you. In fact, most of the time, it was dairy, eggs, and gluten. 14:12 You know, and I had to deal with sugar. And then the next … so what I finally realized was: you know what? Pretty much everybody, anyone who has any kind of a food intolerance has leaky gut. So we know that. We don’t actually need to test for that. Right? And, if you pull these foods out for three [00:14:30] to four weeks, and then the first couple of days you’re craving some of the foods because one of the signs of a food intolerance is craving the food that hurts you, and by the end of the week, all of a sudden, you have joint pain that’s gone, skin’s cleared up, headaches are going away, fatigue is gone, you don’t have the gas and bloating. We can pretty safely assume that one of the foods was causing a problem. 14:48 Give you three to four weeks to totally detox and reset, and then one by one, go back and test those foods by eating them, and stopping when the reaction starts some time in the first four days. If you can [00:15:00] go three to four days, and you don’t have a reaction, you’re okay. 15:04 But, I look at that, and I go, “It doesn’t cost anything. You get real information” because you know there’s a variety of ways we can become intolerant to a food. The most common is a food sensitivity due to leaky gut, but you also have the hormonal responses to it, you also have genetic responses to it, and really, all that matters is: I eat the food I feel crappy. I don’t really care what the test says. If the test says, “No, you’re fine with eating corn,” but you eat corn and [00:15:30] feel crappy. To me, don’t eat corn. 15:31 And, the other problem is: we also have, “Is it the gluten or the Glyphosates in the wheat?” You know? Is it the corn or the genetic modifications and the Roundup they’re spraying on it? I don’t know. It’s all bad. 15:42 So I looked at it all, and I went, “I still think there’s a definite … I like doing stool testing to really look at your gut microbiome, but for food sensitivity, you’re your best detective.” Now, after you go through the three or four weeks, if you’re still having some of those symptoms, then go do a comprehensive [00:16:00] panel and see if you’ve got some weird outliers. But quite often, if you feel better and you’re doing stuff to help with your leaky gut, like managing stress and things like glutamine and good essential fatty acids and freshly ground flax seed meal, a lot of the stuff gets better. 16:19 How long would it take, then, to turn this ship around? Let’s just say that we’re doing everything right, and we are on top of our supplements as well, and we have de-stressed. What [00:16:30] time frame are we looking at, and when that time frame is … when we’ve met that time frame, are we going to be more resilient to these foods? 6:39 So, it really depends how bad your gut was going in. 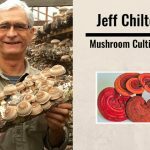 And that is where having a good gut microbiome, eating fiber-rich – both soluble and insoluble and resistant starch foods – so that you can get your gut microbiome really strong, doing good prebiotics, [00:17:00] doing fermented foods, all of that to really get your gut solid is great, along with managing stress, which is super … like the most important thing there. 17:11 So, assuming that you haven’t really trashed it too much going in, you’ll start to notice a difference with the first couple days and really within a matter of a month or two, you’re really dialed. Now, does that mean you should go back to eating some of these foods? You still [00:17:30] really need to be careful with gluten, you know, for a couple of reasons. 17:34 Number one: because of the Glyphosates, so if you’re going to do gluten, it would need to be organic and would need to be fermented, and it would need to be one of the Einkorn wheat … you know, the older grains, not the new ones. Not the genetically engineered, short little dwarf wheat that’s very high in gluten. So that’s the first thing. But gluten releases something [00:18:00] called zonulin, which makes your gut permeable, and it also can be a trigger for autoimmune disease, so I just personally don’t see the reason that we would ever want to go there. I just don’t see it. With autoimmune disease affecting the US 50 million people and probably more because we’re not identifying it, why would we want to put a risk, do that risk? It just doesn’t make sense to me. Like, it’s not like you’re going to get deficient if you don’t eat gluten. 18:34 So, and I also don’t see corn as a real positive food because of the GMO issue. It’s just a high-starch food. Like if you’re going to eat a higher-starch food, I want a resistant starch food like a potato, so I don’t see the point of that, and you know, dairy maybe if you’ve got really good … you’re eating grass-fed dairy, and it’s raw, and you’re fermenting it. But some of these foods, like eating fructose-rich anything would [00:19:00] never be warranted. It’s never going to be good for you. Eating any added sugars, eating fruit that’s been dried or made into juice or concentrate, so you turned it into a soda, candy, or syrup doesn’t make sense. So it’s not … your gut will be more resilient, and you can … like I couldn’t tolerate eggs when I first did this, and I healed my gut, and now I can rotate in pastured eggs. 19:24 But I think it doesn’t mean go treat it like a trashcan again because guess what will happen? You’ll go straight back to where you were. Stu: 19:30 [00:19:30] Yeah, yeah. So then just to connect that: so we’ve got a whole heap of chaos going on in the digestive system. We’re stressed to the hilt. We’re eating all the wrong foods anyway. So that connection between everything that I’ve just mentioned and weight gain … how is that? 19:51 How does that happen? 19:51 Yeah. How does that happen? 19:52 Yes. How does that happen? So, there’s a couple different things going on. Number one: when you have a food intolerance and you eat [00:20:00] the food, you create inflammation. You create inflammation. It’s very interesting. There was a study that was looking at inflammation and obesity because we know that when you have more fat, you create more inflammation, but we also know that when you have more inflammation, you gain more weight. They both … it’s a cycle that goes. So inflammation can create obesity, just like obesity can create inflammation, and inflammation can make your cell membranes worse so you can become more insulin-resistant, and more insulin resistance creates more inflammation. 20:28 So that’s the first part is that [00:20:30] bad cycle that’s spinning. 20:32 The second part is: you start to crave the very foods that are hurting you, so now all of a sudden, you have cravings, and they’re not cravings for broccoli and salmon. It’s cravings for pizza, for cheese. I mean, the most common ones are cheese and bread, so there’s that problem as well, of you just wanting to overeat. 20:51 But it’s really the inflammatory part of it that creates the big problem, and then that inflammatory problem can create low energy and headaches [00:21:00] and joint pain, which then sets you up for like, “I’m not going to be exercising much” that can also then get in the way of your sleep, so all of those things go together to start to create the problem. 21:12 Got it. Got it. Vicious, yeah. Vicious cycle. 21:16 And by the way, I just have to point out here, when I was looking at food sensitivity testing, and this all kind of plays off this elimination diet, which has been around for decades as a way to help people. And [00:21:30] I kept looking at that elimination diet going, “I don’t understand this thing. Why do they have all these outlier foods in here that I never see on any of the tests? Like let’s make the…” because it was so hard to follow, so complicated. 21:40 But why don’t we make this easy, and then if you don’t get solved on the first one, we’ll test and go to the next level, but you … but this is not doable. 21:48 I never considered using food sensitivity testing as a weight loss technique. I was using it to help people follow a healthy diet [00:22:00] and to help them with joint pain and headaches and autoimmune, fatigue, and gas and bloating, and skin problems, and the side effect was weight loss. And by the way, fast weight loss. Like the first week, they would lose up to seven pounds, and the cool thing was is it didn’t come right … like, you know, you’re like, “Oh, that’s just water weight. Blah blah blah.” Well, yeah. A lot of that’s inflammation. No question. 22:41 That’s fantastic. Yeah. It’s funny, isn’t it? When you dial into the right way of eating as well, and you do start to get on top of all of these areas, your body just goes into, “Right. We’re going to fix this stuff,” and it has the mechanisms to heal as well. 22:57 You touched on exercise [00:23:00] previously as well, and I want your take on exercise in that I think it can be as destructive as it can be as healing, so what are thoughts on that? 23:11 Oh my God, get out of my head, man. I have a … I actually have a line I say that exercise can be therapeutic … exercise is a drug. It can be therapeutic or destructive, and because I started out as an exercise physiologist. That was my world, [00:23:30] and back then, everything was about … and I was aerobics instructor way back when, and everything was about doing long, slow distance training. Lots and lots and lots of cardio. And I started to notice a couple things with people: number one, they couldn’t put muscle on. And this was me included, in my twenties. You couldn’t put muscle on doing tons and tons of cardio. I used to teach aerobics classes. I would teach some days three to five of them, and then I would go out with clients and take them jogging, and I mean, I would do aerobic types of stuff all [00:24:00] day long. Couldn’t build muscle, even though I was lifting like a fiend, and I was in my twenties. I should have been able to. 24:05 I got sick so easily, and so poor immune system, really weird hormonal stuff going on, and because it trashes your adrenals, and so trashes your adrenals, trashes your immune system, and it makes it very hard to build muscle. Now here’s what’s interesting: [00:24:30] that’s if you’re doing loads of cardio. I tell people to do … the only thing I want to see you do is walk, and to me, walking isn’t really exercise. Like, walking is what we do to survive. We should be walking like an hour a day. We all need to move more. 24:45 When I’m … where I live right now, there’s nowhere to walk. Thankfully I have a dog. I mean, there’s beautiful places to walk. It’s incredible, but it’s not like you could walk to town. You’d be walking three miles. So, but it’s a great place to walk a dog. So I think everybody should have a dog [00:25:00] who guilts them out every single day, multiple times a day. We all need to be walking more, but I have a friend who calls that controlled falling. That’s just part of our activities of daily living. 25:11 To me, the only exercise … I don’t ever do straight cardio exercise ever. I do burst-style training, high-intensity interval training, which does the opposite. It can elevate your anabolic hormones instead of elevating your catabolic ones, so you’re building up rather than breaking down, and it teaches your body how to handle stress better, rather than creating [00:25:30] stress on your body. 25:31 So, that’s why I’ll do high-intensity interval training, and I do resistance training, same thing. But I don’t do … you’ll never catch me out jogging or doing anything … never. I just don’t do it. 26:10 Well, all the oxidative stress. Think about it. Like, all you’re doing is creating a ton of free radicals. And we all hear about antioxidants. Well, if you’re going to go do that, you’re going to trash your adrenals, and you’re going to create so much oxidative stress. You’re going to shrink those telomeres, so forget it. Why would we want to do that? 26:28 And, but [00:26:30] it’s not fun anyway. And the biggest reason people don’t exercise is because they don’t have time, so then you say, “Oh, you need to work out for three hours a day.” I’m like, “No. You need to work out 15 to 20 minutes. You do need to move more, park farther away, do all that, but you know, keep it, keep it…” and the shorter you go, the harder you go. 26:45 Yeah, no. That’s great advice. 26:47 And does timing come into that for you in terms of if we want to sleep well, we probably wouldn’t want to be lifting weights and jumping around in a Crossfit gym at 10:00 PM? 26:59 I taught [00:27:00] aerobics in Japan when I was at … when I was in college, I went off to Japan to teach aerobics, and I taught a class at 8:00 PM. And I went to bed at 2. And, so it depends on what you’re doing, but yeah. Exercise, I mean, ideally, you get up in the morning, you go work out, and then you go have a good protein, healthy, low-carb but some carb protein hit afterwards, but you want some carbs to refuel your muscle [00:27:30] stores of glycogen, but I don’t work out in the morning because that’s my best brain time, so that’s my money time. 27:37 So I work out in the middle of the day when no one’s working out. Either at a gym or, you know … because if I’m going to go to a gym, I don’t want to go to happy hour. I want to go do my thing with no one in the way. 28:00 [inaudible 00:28:00] is productive. I don’t want to destroy that. Things that are the most beneficial for long-term health. If there was a magic three like, “Guys, just do this and you’re gonna be way ahead, streaks ahead of everybody else,” what would they be? 28:17 Okay. The first and second are probably not what you think they are. The first one is have an amazing, tight group [00:28:30] of friends. 28:34 That’s it. That’s the number one. Last night … We had Thanksgiving in the U.S., and last night we had friendsgiving, our family of choice. Social isolation, I think, is gonna be the biggest disease of our lifetime. It is absolutely frightening to me. In fact, I just heard Dan Buettner came and spoke at an event I was at. He was talking about the most important longevity factors and one of them was having at least three people that if things hit the fan you could call. [00:29:00] For me that is my number one. 29:03 My number two is sleep. 29:06 Sleep, sleep, sleep. In fact. There is no way you can follow a healthy diet if you steal from your sleep. You’re gonna be hungry and it’s not gonna be for salmon. It just isn’t, you know. So, and you’ll get more insulin resistance, super important. The third thing. Gosh, so social isolation they liken to smoking half a pack [00:29:30] of cigarettes a day. I just saw another one where not exercising was worse for you than smoking. Not to say that we should go smoke, but exercise is probably the third. Now, you would have thought I would have said food. Probably a couple of months ago I would have said, “Oh, my gosh, if you want to change one thing I’d change food,” and those probably would become four, five, and six. But, at this point I really believe it’s community, sleep, and moving. 30:08 If you looked at the common factors it was people wasn’t it? 30:11 Communities and movement, right? 30:13 Yeah, communities and purpose. You can see nowadays that we are connected to these blooming Smart phones. It takes away the community, because we don’t need to speak to people or meet people anymore, because we can message them or send them silly emojis. [00:30:30] We’re becoming far more insular, as well, which is a real shame. Take me back to the 80s. That’s all I’ve been saying. 30:39 You know, I’m actually just going completely retro on all this stuff. I put on events regularly, so I have big events for my community, but I also do dinner parties. I do all sorts of stuff to bring people back together again. I think it is the most critical thing that we can do. 30:58 Yeah. No, I [00:31:00] absolutely agree, and I always look at my grandparents and how they lived long and happy, healthy lives. They lived into their 90s. They were very social. They used to eat meals together as a family, social connection, used to tend to their garden, had an allotment and grew their own vegetables, things like that. They weren’t stressed out, and they used to move all the time, because that was the nature of their work. That seems to be the catalyst and the backbone for your best [00:31:30] shot at longevity. I do wonder, I do wonder where we’re going. 31:36 I don’t think it’s pretty. I was at dinner with Deepak Chopra a couple months ago and that one of the questions … I brought a group of my people, my Mastermind, to go have dinner with him. It was super cool. It was like, “Alright, what do you think about all the stuff going on?” He’s like, “Basically, it’s gonna be the end of civilization.” Well, maybe. I mean it’s like this … You kind of look at it and go, “Did, this make things [00:32:00] better?” I mean, like I don’t know that it made things better to always be reachable. Now if someone doesn’t respond back right away you’re like pissed. 32:10 Yeah. That’s so totally right. I had a chat to Tom O’Bryan, a couple of weeks back, and he was talking about testosterone markers for guys now because they’re moving around with these mobile devices in their pocket. 32:24 Oh, yeah. I’ve told my sons never to do that. Tom’s one of my neighbors. 32:29 Oh, [00:32:30] is he? 32:30 Yes, we’ve been friends for 20 years. 32:33 Yeah, a great guy and a real pioneer in what he’s doing. 32:39 But, it makes you stop and think, “Well, hold on a minute. My phone’s in my pocket and it wasn’t in my father’s pocket during that time, or his grandfather’s pocket.” I can see real changes happening there. But, oh well, we’ll see. 32:55 See how we go. So, we’re coming up on [00:33:00] time but I’m just intrigued as to the non-negotiables that you personally ensure that you do every single day to crush your day, and it might be that I always get up at x time and drink this water with some lemon or whatever that might be. What would they be? 33:20 It is how I wake up, so I usually wake up without an alarm, but if I’m using an alarm I have this Phillips light and it looks like a moon and it tweets at you so [00:33:30] you hear little birdies. It’s not one of those like waaaaa, you know, jarring you out. So, you wake up like feeling like you’re just waking up to this beautiful thing, and we open the drapes right away. Now, that doesn’t help right now with daylight savings, but it helps most of the time, you start to see the sun pretty quickly so that’s important. So, that’s the first thing. 33:51 Second thing is where my mind goes when I wake up, which has to go to gratitude, and the big things that are really exciting me, the purpose. [00:34:00] that’s going on, which is normally I like to write down. I don’t always get it written down, but generally I’ll pull something out to write down what I’m grateful for and what are the big exciting why’s I’m working on. Then, my hubby brings me a cup of Bulletproof coffee beans. I only do it bulletproofed when Dave actually is making it for me, so Dave. He lives too far away, but I always drink bulletproof beans because they are clean, and I don’t want to get all the crap that’s on our coffee beans. 34:44 … who quite often when I wake up first thing in the morning and that little chirping is going on, and I look over to look lovingly at my husband and my dog’s head’s on the pillow next to me under the covers. 34:54 Oh, boy oh boy. 34:56 She thinks she’s a person. That’s it. I find it’s like [00:35:00] the way you start and end your day is so key critical, so I always start it and end it in a very positive like whatever the winds, what’s great about today, because even if things are totally sucky you can always find something good, right? 35:17 Do you have a particular sleep routine that you like to follow? 35:22 Yes, and it’s driven me crazy because I travel half the time and these hotels … Shout out to you hotels getting rid of your bathtubs, this is a really rotten [00:35:30] idea. I actually have little bath salts that I travel with. I get in the bathtub and I do Epsom salts baths with some lavender at home and so I always do that. Right now it’s winter so we light a fire, but we cool down the overall temperature, and I always take a bath. We take all the lights down, so we just kind of prepare our body, and I putter. I think women especially need to do a little puttering. 35:57 The other thing that I do that kind of like has helped [00:36:00] me signify the end of my work day that I was bad at before I met my husband. Me single or left on my own I will work and work and work and work. I’ll keep working and then I’ll take a bath and go to bed. Thankfully now usually around 6 o’clock I stop. I go make dinner like a normal person and then we sit and we actually take some time, sit down, eat dinner together, go walk the dog after dinner, and then I go take a bath and I read a good, not great, [00:36:30] book. That’s my big rule is I cannot read a great book because I’ll stay up all night reading a book. I was doing a podcast with Roland Frasier. He goes, “What kind of books?” I go, “I so don’t want to admit this. I’m a total [inaudible 00:36:42] chick-let book,” but I have to, because if I read some amazing book I’m just going to, that’s it I’ll stay up all night. 37:01 Yeah, I have to. I will think, think, think, think, think, think, think, right? 37:04 Yeah, you immerse yourself in trash and that just slips away. 37:08 Yeah, there you go. I mean, it’s like, you know, it’s just like those fun little chick-let novels as opposed to like some amazing medical thrillers, [inaudible 00:37:17] that one with Dan Brown novels. I can’t read a Dan Brown novel. That’s a vacation read. 37:22 Yeah. No, I actually read … I love Dan Brown. I haven’t read his new one. You cannot put that book down. 37:29 It’s impossible. [00:37:30] Impossible. Well, fantastic. So much information, so privileged, as well, to have connected with you, so thank you so much. Just before we go, what’s next. What have you got? 38:48 You just need the motivation and the inspiration, which are the hard part. 38:58 … and no [00:39:00] excuses. Fantastic. How can we get more of JJ Virgin? Where would be the best place to point all of our listeners if they want to find out as much as they can? 39:09 Best to go to the website and that will direct out from there. Thank you. 39:15 Great. Fantastic. Okay, well look, thank you again so much. You’ve been a gem of a guest, really appreciate your time. We’ll share those links in the show notes and look forward to keeping an eye on all the craziness that happens in [00:39:30] your world. So, thanks again. 39:31 Thank you. I’ve never been called a gem of a guest. 39:34 Well, there’s a first time for everything.